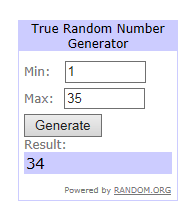 Winners results for #48 are in the post below. 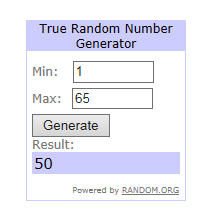 65 entries. I was overwhelmed. in my 2nd Anniversary challenge . 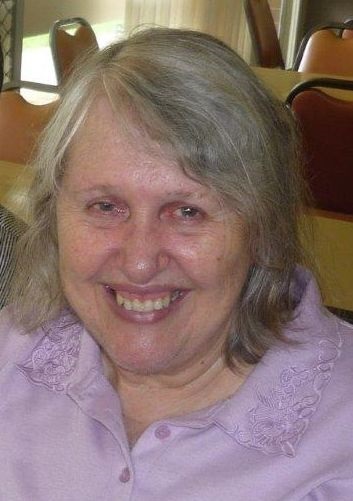 I am 70 and live in Sydney, Australia with my husband Tony. I have two daughters and four granddaughters. I was made redundant at work at the end of January 2013 so after working for 53 years I am now retired. I started stamping and making cards in 1995 and started scrapbooking about 1999 and making ATCs in 2005. I am still a cute stamper. My favourite colours are purples and pinks. 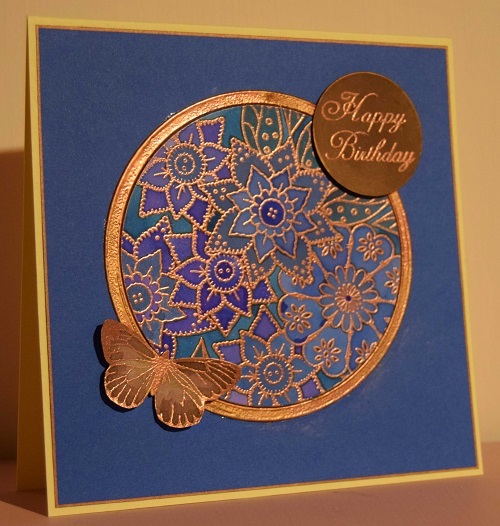 I started my blog in April 2012 with the help of cyber friends and started joining challenges to give me ideas for my cards and then was excited to be invited to join some design teams. I have lots of rubber and clear stamps but use mostly digital stamps now as they are easier on my sore hands. 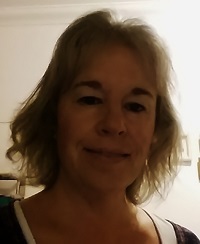 I suffer from fibromyalgia and arthritis and have eye problems so spend my days making cards, a little scrapbooking and talking to my cyber friends on the internet. This helps take my mind off the pain. I have made many more cyber friends since starting my blog. My eldest daughter Lynda and I are cancer survivors and we thank God for every day and for all our friends who pray for us. 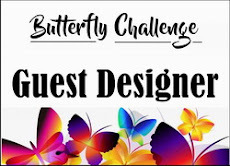 I was excited to be asked to be guest designer for Butterfly challenge as I love butterflies and this is one of my favourite challenges. I hope you will join in the challenge." then here is a paint chip to give you an idea of the colour. to help get your ideas flowing. 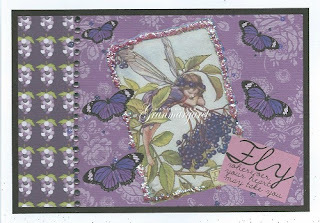 For card 1- I used two papers from JC Sweet Pea "Grape Escape" paper set and a precoloured image from Gecko Galz "Flower Fairies Collage Sheet 1". 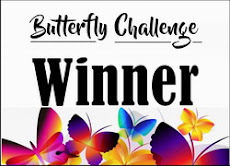 Butterflies from Digital Scrapbooking Studio. Sentiment from Ginger's House blog. Added rhinestones. Added glitter around image. Card 2 - I printed Ching Chou-Kuik digi stamp "So Long Yesterday" onto white card and coloured with chalks, markers and glitter pens. 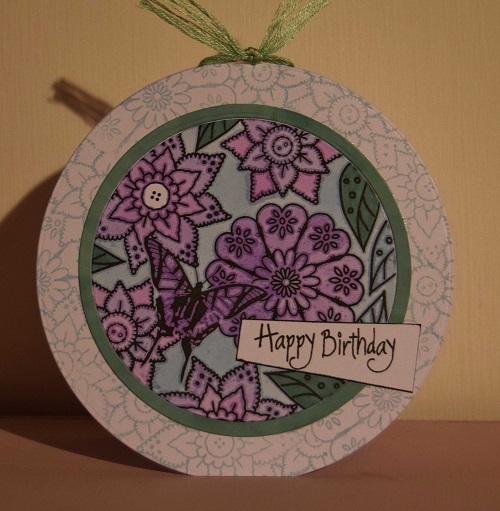 Layered onto jac paper, covered background with glitter and layered all onto purple card. Added punched butterfly. Please visit Margaret on her blog to see them in detail. You can see more details over on my blog. my Stamping and/or Sapphire Challenge. My goodness such a lot of entries. so thankyou for taking on board the new theme. that it was hard to bring my Top 10 down to just 3! New Top3 badge from the side bar. Please also take your New Winners Badge from the side bar. Winners results for #47 are in the post below. 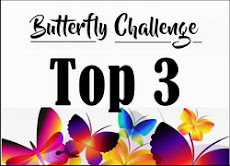 My Butterfly Challenge is 2yrs old today!! Where did all that time go to. to play along with me. and start a brand new set of letters and themes. I'm introducing a new mix into the challenge too!! 'It is nearly four years since I bought my first set of stamps. As I have said before, they should have come with a warning that they are highly addictive! I bought one set of Inkylicious stamps, two ink pads and an acrylic block. You can imagine how my collection has grown since then. 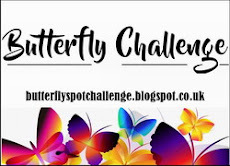 It was a while before I was brave enough to create a blog and enter any challenges but I have had so much fun and learnt so much from reading other peoples posts. When I'm not stamping I'm happiest in my wellies sowing and growing. I find plants as addictive as stamps. with the additional option of S is for the colour Sapphire. 'The way I have made these cards is by stamping the flowers and then painting in the colour using a brush, ink and water. I use a Big and Juicy ink pad squished onto an acrylic block for this as the colours blend so well. I mix with water to get darker and lighter shades. Please visit Alison on her blog to see them in detail. I'm back on an acetate trip again! ground and came and played along. 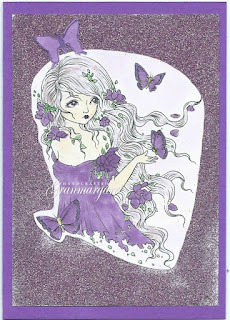 (With her butterflies undulating down the card). I so need to make one of these now! It's a brand new start to a new set of letters/themes.